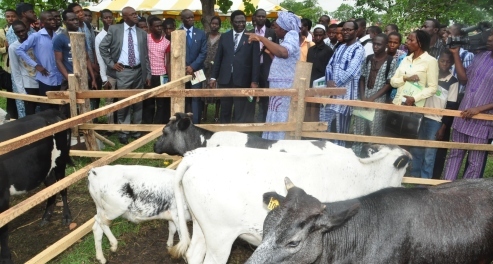 Beginning from March 15, 2012, the Federal University of Agriculture, Abeokuta (FUNAAB), will commence investment opportunities in Cattle Production Venture, by providing boarding facilities for Bulls, Cows and Calves. According to information made available to FUNAAB Bulletin by the Chairman, Cattle Production Venture, Prof. (Mrs.) Daisy Eruvbetine, operations of the Venture would involve the admission of animals for boarding until they are ready for collection or for sale. Prospective customers for the venture, include members of the University Community, Community leaders, corporate organisations and members of the public. Prof. (Mrs.) Daisy Eruvbetine reiterated the benefits of the Venture to the University, to be immense in terms of opportunities for revenue generation and student training. For further enquiries, prospective investors are to contact the Secretary, Centre for Community-Based Farming Scheme, Unity Building (Room A116) on Telephone – 0806 040 4928 or through The Secretary: Department of Animal Nutrition, FUNAAB.